Workplace meetings have undergone a physical and cultural transformation during the past five years, both in terms of their location and the technology used to facilitate them. 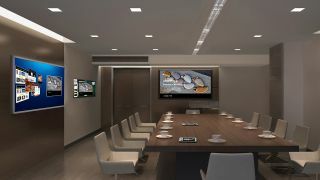 Modern working habits and technological advancements have contributed to the rise of the meeting room as a high-growth vertical for audio visual, unified communications and collaboration technologies. Further to this, employees are increasingly meeting in other areas of the office with major implications for the vendors involved in these markets. The development of modern technologies serving to increase teamwork—and businesses pursuing top-down policies to create collaboration-focused spaces—are fundamentally altering the modern workplace. This evolution is exposed in the Futuresource 2018 Corporate Meeting Room End User Report. One key area of change relates to the physical makeup of meeting rooms. Here, the number of large meeting spaces has decreased during the past two years, predominantly due to the macro trend toward smaller, faster, more flexible meetings. Typically, large meeting rooms are being repurposed for smaller meeting spaces and, with over a quarter of companies looking to add additional meeting rooms over the next three years, the overall total addressable market of meeting rooms is expected to surge. Businesses are very keen to promote top-down policies that utilize space more efficiently and promote smaller, more collaborative sessions among workers. Manufacturers have also been quick to respond to these changes, producing a raft of collaboration technologies designed for smaller meeting room and huddle spaces that are already seeing good traction in the market. Another clear indication that the traditional meeting is undergoing fundamental change is the type and variety of products that are now being used in these spaces. This development is most evident when we look at meeting room budgets, which have grown increasingly diversified across product categories. While the meeting traditionally was the mainstay of telephone and display technologies, we are now seeing that as the size of a meeting room grows, there is a significant increase in spending on goods other than displays, such as audio, collaboration devices and control products. The distribution of budgets is highest in large meeting rooms, where over 60 percent of funds are spent outside of display technologies. This diversification is not only evidence of the growing importance of a wider set of technologies but also the increasing complexity of the meeting room market. Read the 2018 Integration Guide to Collaboration. Demographic change and budget diversification are not the only significant changes happening to the meeting, with employee habits and practices also undergoing a cultural transformation. With more employees working from home, and the increased ability to work in multiple locations geographically or in different areas within an office, workers are now much more flexible with where they are working and who they are working with. Employers have been keen to develop more informal meeting spaces in step with these modern flexible working habits and, with 20 percent of meetings now being held in locations such as kitchens/eating areas, breakouts rooms and receptions/foyers, it is no surprise that 43 percent of companies surveyed as part of this research state they are investing in dedicated technology for these spaces. With dramatic changes happening in the corporate meeting room, technology providers are meticulously following the evolving demands of the modern workplace and how employees work with one another. This market presents both an exciting opportunity for growth but ample room for failure and, with culturally diverse variations in how employees work with one another, Futuresource’s Corporate End User Study provides the most comprehensive guide to the corporate meeting room and the nuances of this rapidly evolving marketplace. Anthony Brennan is a research analyst at Futuresource Consulting.